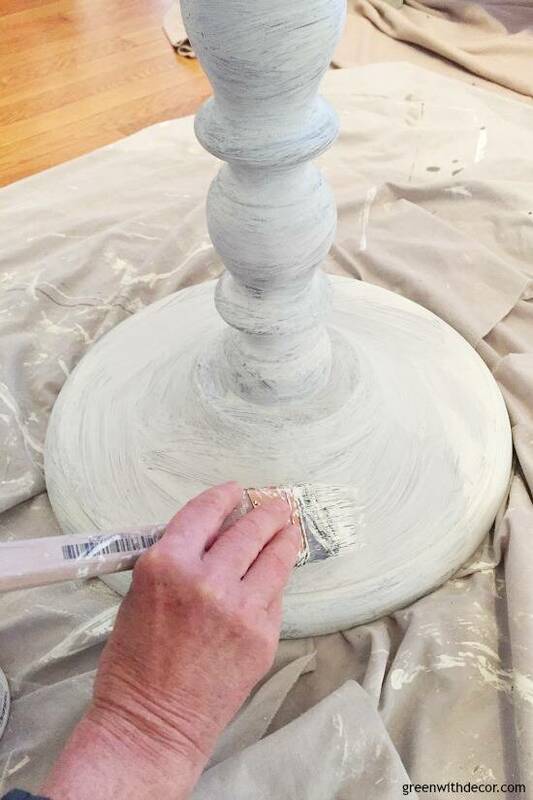 Brighten up a room by using white clay paint to paint a wood table. 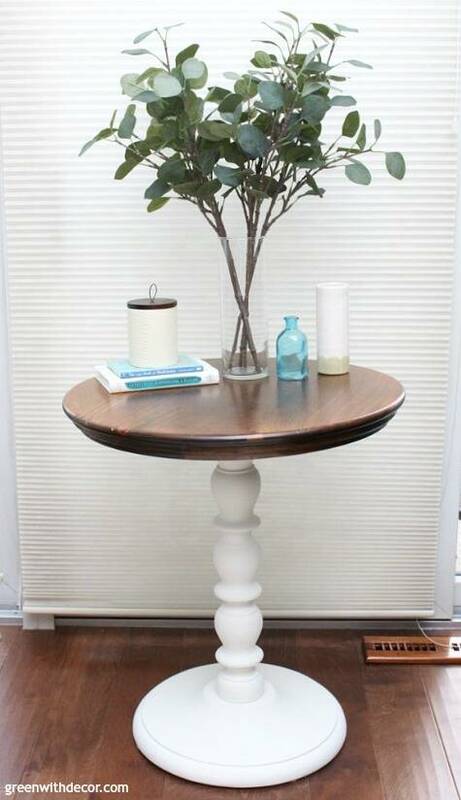 Just follow this easy two-toned round table makeover tutorial. We’ve been doing all sorts of furniture painting around here lately. It just feels good to get some of those pieces on the to-do list all done! My mom and I painted this little round table to give it a two-toned look for my parents’ family room, and isn’t it so pretty?! We’d given some nightstands a two-toned look last year and loved the look so much, my mom wanted to do another piece with a similar look. It was such an easy furniture makeover, perfect if you want to lighten up a piece of wood furniture. With clay paint, you don’t need to worry about doing any prep work to your piece.. If your table is dirty or dusty, give it a quick wipe down with a damp cloth. Otherwise, you’re good to start painting. 1. Tape off the part of the table you want to keep wood. Shake and stir your paint. Then start painting – apply brush strokes in the same direction as the wood grain of your piece. To make sure you get good coverage in all of the nooks of the spindle, you might have to turn your brush sideways in a few spots. 3. Let the first coat dry and do a second coat for good coverage. 4. Remove the painter’s tape. 5. Distress your piece (optional). We didn’t distress this table, but you can see this painted desk makeover or farmhouse dresser makeover if you want more details on distressing. 6. Seal your table with wax. Let your last coat of paint dry for 48 hours before applying the wax. Stir your wax brush in the wax, then apply to your table in a circular motion. Wipe off any excess wax with a clean, lint-free cloth. 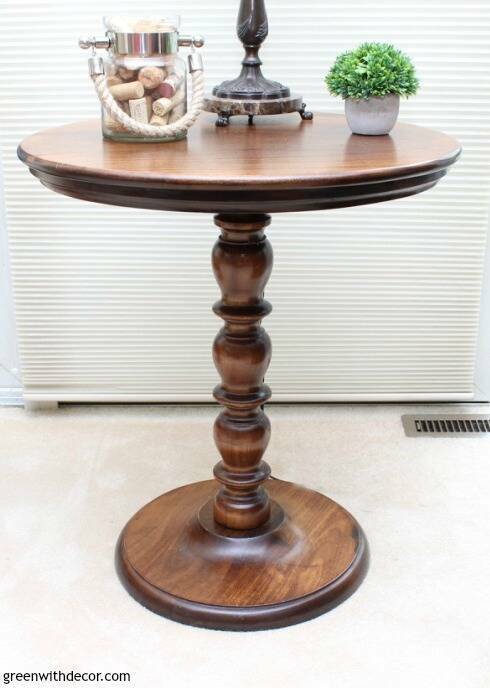 I love the two-toned look of this painted round table, especially with my parents’ hardwood floor.